This method of connection is suggested if you do not have or do not want to use a land line phone for communicating through the dialer. You will need a USB headset to plug into your computer if you use this connection type as it eliminates the need to use a phone. To use this connection type some users have reported issues with 3rd party anti virus software such as Mcaffe and Norton. 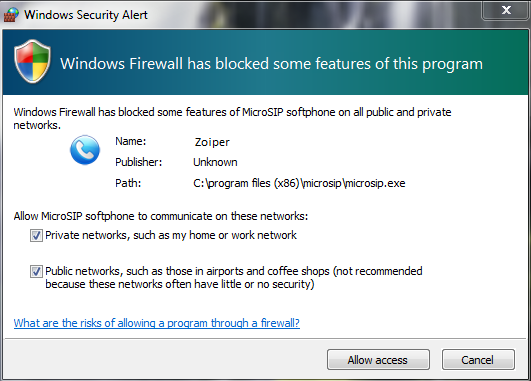 If you experience any issues we suggest you only use the Windows firewall and disable or uninstall the 3rd party anti virus. Choose SIP Phone as shown below. You may get the message below or similar depending on what version of Windows you are using, go ahead accept and run the program. During the install besure to allow the program through your Firewall shown below. 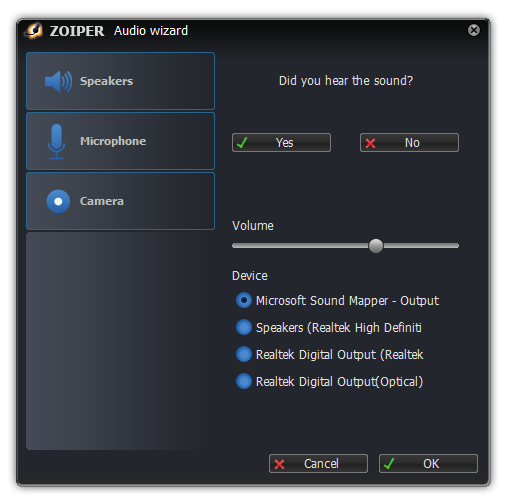 Once you have installed Zoiper you will want to be sure to set your headset as the default sound device as shown below. Open Zoiper from your desktop (if not already open). 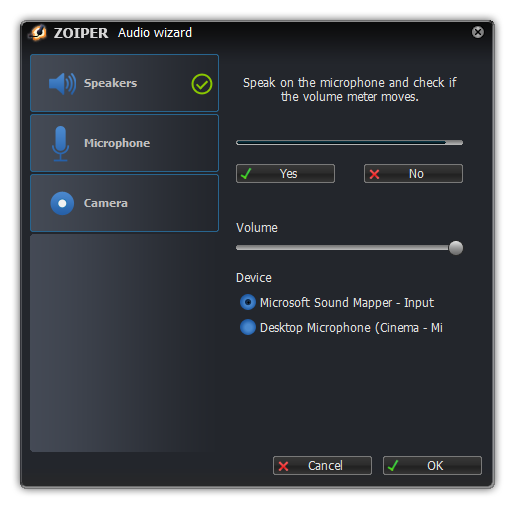 Zoiper comes with a built-in Audio Wizard for easy configuration of your microphone and Speaker. 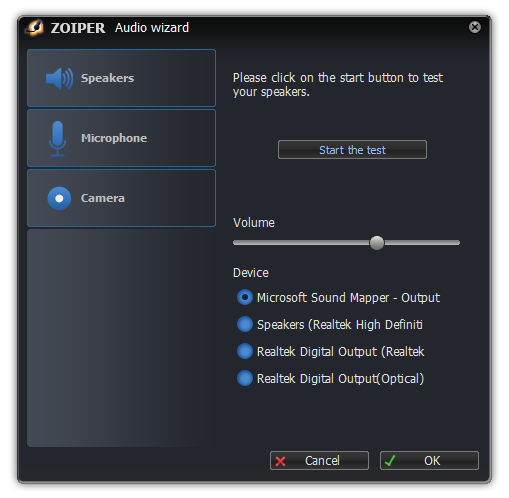 Zoiper will configure your Speakers first. Click on the “start the test” – button. If your speakers are configured and connected properly, you should hear a ringing sound. If you do, please click on the Yes button and move on to the Microphone step. If no ringing sound was heard, please make sure your speakers are connected properly and powered on and if needed change the selected audio device on the bottom of the page to a different one and try again by clicking on the “no” – button. 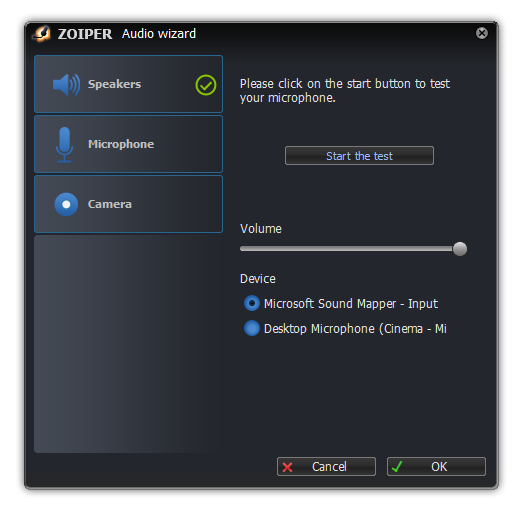 Click on the “Test your microphone” – button to start recording your voice. If the selected microphone is connected properly, you should see the volume meter move when speaking into the microphone. If the volume meter is not moving, please check your cabling and make sure the proper audio device is selected in the Device section on the bottom of the page. 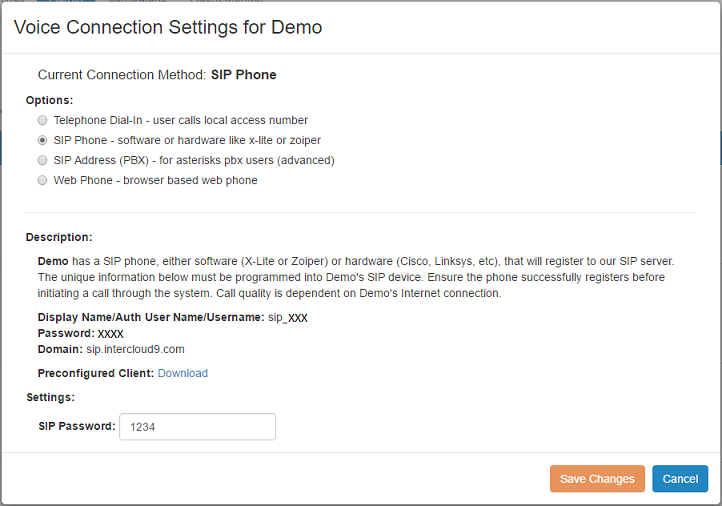 All Done, Now when you click to join a campaign from the Home tab the the SIP Phone will ring and you must Answer/Accept the call to talk through the SIP Phone.